Dean Allan Slickis, Director of OM Studios, is an enthusiastic instructor with a wealth of teaching, recording and performing experience. 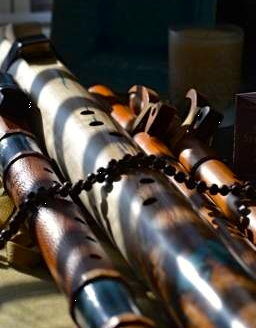 On April 24, 2014, he will be offering a workshop, The Native American Flute: A Beautiful Experience in Balance and Harmony at Amiro Art & Found at 7:00p.m. The workshop is designed for the absolute beginner and is limited to only ten participants to ensure a relaxed, creative, and intimate atmosphere. Advance registration and payment of $40 is required. To reserve your space, call Amiro at 904-824-8460. Amiro Art & Found is located at 9C Aviles Street in beautiful downtown Saint Augustine, Florida. Topics covered during the two-hour workshop will include: How to Hold the Flute, First Fingerings, Beginning Melodies, Phrasing, Traditional Songs and Resources, and Playing from the Inside. Dean brings passion and the true joy of music to his students. He completed undergraduate studies in the Jazz and Contemporary Music Program at Parsons School of Design in NYC, the Detroit Institute of Music and Dance, Southwest Missouri State University, and Shaw University. His graduate and professional work includes the Hindustani classical music of North India, the classical rhythms of North Africa and the Middle East, and a bit of Andalusian flamenco. Over the years, Dean has successfully taught hundreds of students throughout NE Florida via private and group instruction and course offerings at the Florida Community College at Jacksonville, the First Coast School of Music, Music Time Studios, the St. Johns County Continuing Education Program and the First Coast Technical Institute. For more information about Amiro, visit their website at www.amiroartandfound.com.